*** WINNERS *** Cori, Lacey, Jennifer and Jaime are Living the Life of Riley! CONGRATULATIONS! I want to give a big and hearty CONGRATULATIONS to Cori, the winner of the Summer Infant Stylish&Secure Wood Top of Stairs Gate! Cori now has 48 hours to confirm! I also want to give a big and hearty CONGRATULATIONS to Lacey, the winner of the Flow Wall System Starter Set of Choice! Lacey now has 48 hours to confirm! I also want to give a big and hearty CONGRATULATIONS to Jennifer, the winner of the Educational Insights $50 Gift Card! Jennifer now has 48 hours to confirm! I also want to give a big and hearty CONGRATULATIONS to Jaime, the winner of the mod. by C. Decor $40 Gift Certificate! Jaime now has 48 hours to confirm! 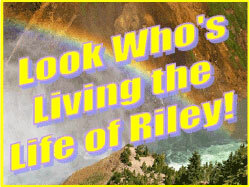 *** WINNERS *** Gina, Harmony, Jennifer, Stephanie and Ashlee are Living the Life of Riley! CONGRATULATIONS!